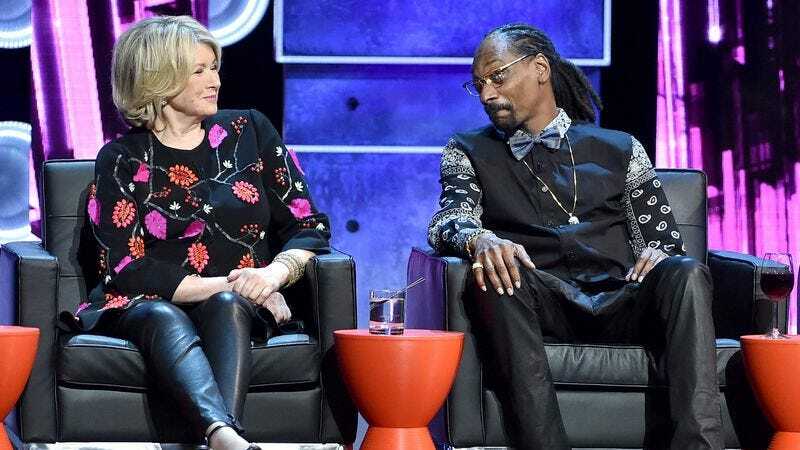 Apparently the thrill of seeing Martha Stewart hang out with Snoop Dogg still hasn’t worn off for America, as VH1 has just ordered a second season of their Potluck Dinner Party series after airing only two episodes. The premise of the show is Snoop and Stewart putting on weekly dinner parties for their famous friends (Seth Rogen, Wiz Khalifa, Kathy Griffin, and Ashlee Simpson to name a few), and its premiere a few weeks pulled in three million viewers and won “all key demos” for VH1. In a statement, VH1 president Chris McCarthy referred to Stewart and Snoop as “the modern-day Odd Couple and the reigning king and queen of pop culture,” which sounds like a little bit of shade thrown in the direction of CBS’ actual modern-day Odd Couple show. Still, that show doesn’t have Snoop Dogg and Martha Stewart putting on a dinner party for famous friends, so there’s really not much competition anyway. Who knows, maybe they’ll get Thomas Lennon and Matthew Perry on the new season of Potluck Dunner Party and do a modern-day Odd Couple crossover.